wow thanks for the feedback it's very unuseful. Location: At my computer failing to get any work done ever. Some tips on the posing: I think that his right arm should be in towards his chest, and the other arm swung backward, as well as his head being turned left instead of right so it makes more sense with the POV. Also, either his right leg should be less bent and pointed forward more or he (the collective "him") should be tilted forward since the posing looks a bit awkward currently. I like the lighting tho, nice style! He's turning to the right, that's why everything looks so weirdly bent and stuff. Also are you saying that his right arm should be in front of him and his left arm behind him? Because that's completely wrong if that's what you're meaning. 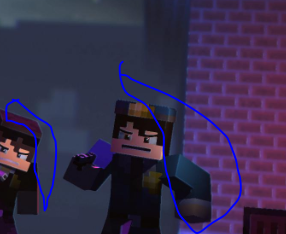 what i do when i have extreme lag is make some lights/characters with alot of detail/detailed stuff invisible (or hidden in LQ) with lighting disabled, that way i can properly move lighting. my question is how this caused 4 fps in the viewport.